Finally I am in Kolkata, after one long year. Very busy in getting together with near and dear ones. The moments being spent with my parents over long hours of conversation are the most precious of all. So involved me and maa both become in our talks that forgetful to keep check on time, we have been retiring to bed around 3 o'clock at night since last 3-4 days. My mother in an unusual mood of reminiscence is sharing tidbits of her childhood and teenage days and for the first time in my life; I feel that we both, transgressing the boundaries of mother-daughter relationship, have turned into friends. I have learnt, this time, a handful of recipes from my mother which are staple at my parents' home. I will be sharing them gradually. However, the recipe below is not my mother's concoction. I have picked it up from a cookery show. Hope you all will like it. 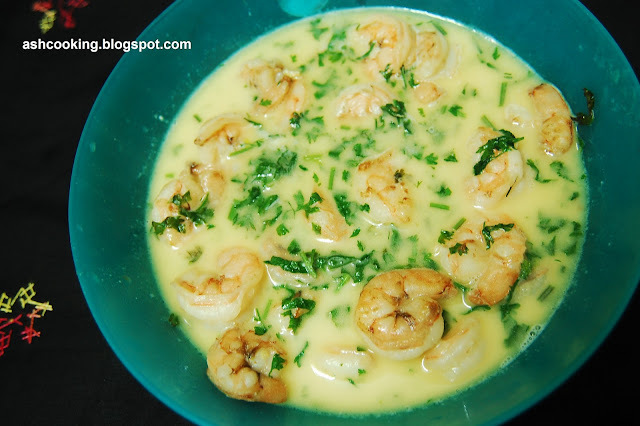 1) Marinate the prawns with lemon juice for an hour. 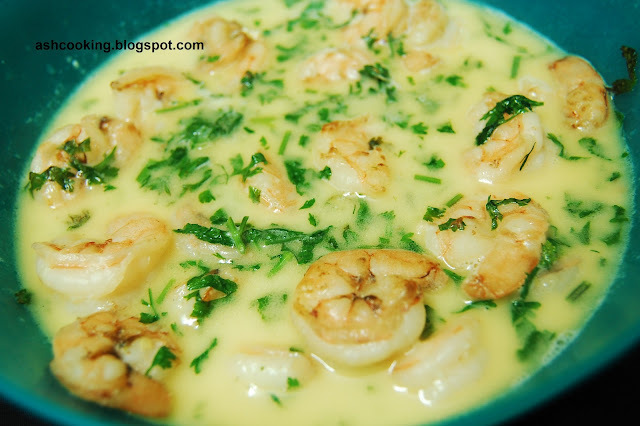 2) Heat oil in a pan and shallow fry the prawns. 3) Add chopped garlic and green chillies. Sauté. 4) Add cashew nuts paste. Stir around. 5) Add coconut milk, salt and a dash of water. Bring the gravy to a boil. 6) Squeeze about 1 tsp of lemon juice. Finally serve garnished with coriander leaves.